Warning: long post, with many images, also religious content, which may offend some. The moment in Moria when Frodo, revived, is seen to be wearing the mithril shirt is for me one of the most strangely moving in FotR. Of course I wanted someday to cap it. In preparation for this Moria series, I did. In this post, I offer the results of my staring and thinking. First, I will present the actual scene, well-described in the book. It takes place well after the film sequence occurs, past the Dimrill Stair and Mirrormere, half way to Lothlórien, but the screenwriters drew from this scene. How I love this description of brave Sam and Frodo, wounded and in pain yet uncomplaining, struggling to keep up. And how I love the care the other members of the Fellowship show them as they tend them. For some time Frodo and Sam managed to keep up with the others; but Aragorn was leading them at a great pace, and after a while they lagged behind. They had eaten nothing since the early morning. Sam's cut was burning like fire, and his head felt light. In spite of the shining sun the wind seemed chill after the warm darkness of Moria. He shivered. Frodo felt every step more painful and he gasped for breath. Soon afterwards they came upon another stream that ran down from the west, and joined its bubbling water with the hurrying Silverlode. Together they plunged over a fall of green-hued stone, and foamed down into a dell. About it stood fir-trees, short and bent, and its sides were steep and clothed with harts-tongue and whortle-berry. At the bottom there was a level space through which the stream flowed noisily over shining pebbles. Here they rested. ‘No!’ said Aragorn. ‘We must have a look and see what the hammer and anvil have done to you. I still marvel that you are alive at all.’ Gently he stripped off Frodo’s old jacket and worn tunic, and gave a gasp of wonder. Then he laughed. The silver corslet shimmered before his eyes like the light upon a rippling sea. Carefully he took it off and held it up, and the gems on it glittered like stars, and the sound of the shaken rings was like the tinkle of rain in a pool. There was a dark and blackened bruise on Frodo’s right side and breast. Under the mail there was shirt of soft leather, but at one point the rings had been driven through it into the flesh. Frodo’s left side also was scored and bruised were he had been hurled against the wall. While the others set the food ready, Aragorn bathed the hurts with water in which athelas was steeped. The pungent fragrance filled the dell, and all those who stooped over the steaming water felt refreshed and strengthened. Soon Frodo felt the pain leave him, and his breath grew easy: though he was stiff and sore to the touch for many days. Aragorn bound some soft pads of cloth at his side. In both the book and film, the mithril-coat (or 'corslet' or 'shirt'), which was given by Thorin to Bilbo and then to Frodo, is discussed by Gandalf early in their journey through Moria. "A kingly gift!” Gimli exclaimed, hearing of it. Yes, Gandalf agreed. Bilbo did not realise it, but its worth "was greater than the value of the Shire and everything in it!" 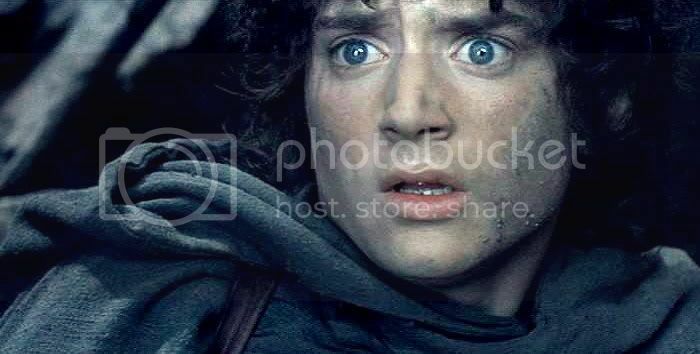 Frodo is shown as awed to be wearing something so magnificent; overwhelmed, perhaps, even abashed. He says nothing. 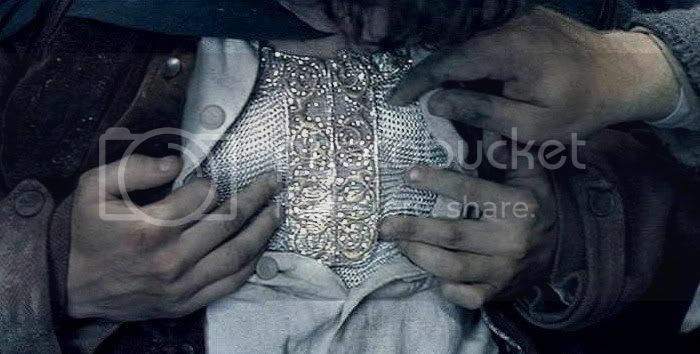 When it does come to the revealing of the mithril shirt, in the film Frodo reveals it of his own accord, in answer to Aragorn’s astonished remarks (“You should be dead; that spear would have skewered a wild boar!”). Revealing the shirt, Frodo confesses to Aragorn and the rest, without words but as if to say, "This which you see here is what kept me alive". In the book, things are different when it comes to the discovery of Bilbo's secret gift. Frodo does not reveal he is wearing the corslet. After he has been wounded, he won't complain about his hurts, and resists all attempts to see or dress his wounds. Only when Legolas notices Frodo and Sam lagging far behind, and the others refuse to let them go on uncared for, does he submit. Aragorn almost must force Frodo to let his injuries be examined and treated, which is when the mithril shirt is discovered. Why does Frodo resist so strenuously, and for so long, the dressing of his wounds? For starters, he doesn’t want the Company to lose time in order to tend to him. And, as shown below, he promised Bilbo in Rivendell that he would keep the shirt secret. Perhaps Frodo is a bit embarrassed, too. Everyone thinks he has an amazingly sturdy constitution to have survived such a blow, but Frodo knows it comes from a loaned shirt. ’I should look—well, I don’t think I should look right in it,’ said Frodo. ‘Very well, I will take it,’ said Frodo. Bilbo put it on him, and fastened Sting upon the glittering belt; and then Frodo put over the top his weather-stained breeches, tunic, and jacket. 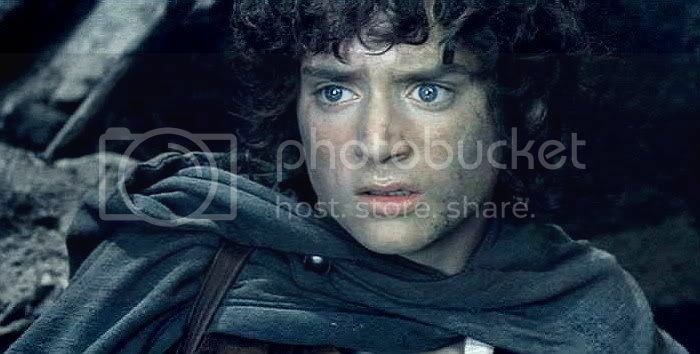 A sense of Frodo's humility comes across in the film scene, and it is a pleasure to see it. But the scene has a power that comes from something more than a demonstration of Frodo's humility. Something else is going on in it - or under it - or through it. Whatever it is, I thought, scrolling through the pretty images I had made, it was not there in my screencaps. Whatever gave the scene its profundity and power was missing. Watching the scene had been for me almost like a religious experience. So I scrolled and re-scrolled through the screencaps, dissatisfied and puzzled. Then I watched the DVD scene again, finally viewing it frame by frame. As I moved through the frames of the mithril corselet it dawned on me. It wasn’t the image of Frodo's exquisite face that gave the scene its power -- not this time -- it was the image of his exquisite shirt. The power of the scene, it turned out, came not from the image of Frodo’s face, but from the image of the mithril corselet. Upon it the camera dwells long and lovingly, almost with adoration, as if the shirt were more than a shirt -- a sign and revelation of something in Frodo -- perhaps something greater than Frodo, which shone through him. I will recapitulate the film scene. Frodo, face down on the stone floor, is pulled up by Aragorn, who is amazed to discover the Ring-bearer is not dead. Supported by Aragorn, Frodo reclines on his side, his breathing laboured. He manages to sit up with pain, his hand on his wounded breast. "I'm not hurt", he assures them, panting. But Aragorn is still confounded. That spear-thrust should have killed him, he insists, staring hard at Frodo. Frodo opens his linen shirt tentatively, revealing the upper part of the famed mithril corslet. He does not unbutton the whole of his shirt, which would make the garment fully and easily visible. He unbuttons his shirt only part way, using his fingers to draw the linen down and aside, so that the mithril can be seen. The others react with awe and wonder. Howard Shore's scoring creates a musical radiance, making the scene take on a "glow", as if what is being witnessed between the drawn-back plackets of Frodo's linen shirt is awe-inspiring; miraculous, for the camera has moved in close, so close that Frodo's face is no longer in frame. 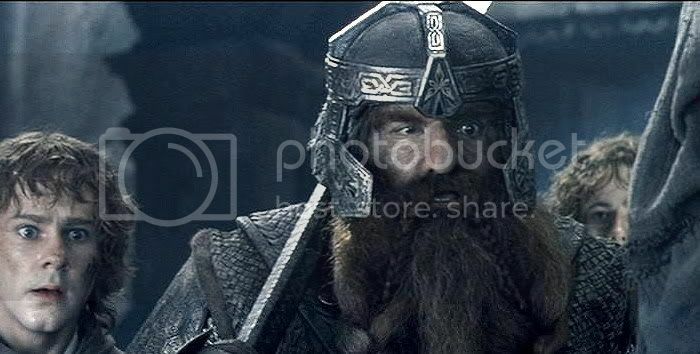 “You are full of surprises, Master Baggins,” Gimli comments dryly, yet he, too, is awed. And not just by the shirt. That Frodo should have the shirt, and should be wearing the shirt when dealt what should have been a mortal blow, is not lost on Gimli. The degree of awe seems to reference the "something else at work" in the world, the power for good that Gandalf told of, a power "beyond any design of the Ring-maker". The camera, still tightly focussed on the bosom of the the gleaming shirt, lets us see Sam's hand as it moves to touch the shining mail. His hand moves slowly, lightly, tentatively, as if to test whether it’s really real -- whether Frodo's rescue from death is really real. Or maybe it's just to touch something so exquisite and finely made. We see Sam's disembodied fingers move over the glittering mail as if it were a holy relic. In asides, the eyes of the others are filled with wonder like that of the shepherds looking inside the crêche on Christmas morning. Shore's heavenly music furthers the sense that what we (and they) are seeing is much more than a cunningly-wrought piece of protective armour. What I experienced as I watched felt "religious", and it was created by references to religious iconography of the past, musical and visual. 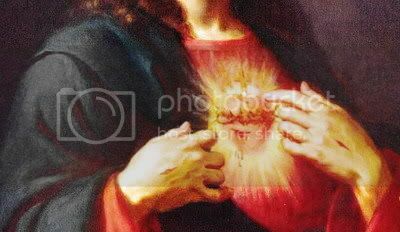 Suddenly I saw the screencaps before me as images of an icon; an icon familiar to me from art history, Sunday school prayer-cards, and cheap votive candles sold at the local grocery store: the icon of the Sacred Heart *. This is not the cue, I hope, for readers who are Christians to cry, “Blasphemy!” or for those who do not hold religious beliefs to protest, “Bah,religion!” I’m just saying what I saw. Every Tolkien reader knows that in life Tolkien was a devoted Catholic Christian. Yet he chose to write his secondary world as non-Christian. In Middle-earth, Tolkien meant to portray an ancient world, but the real world, long before the God of bibilical accounts appeared. Of course, then, there could be no mention of this god. Yet peoples of the ancient world were not without god, or gods, or a sense of the divine. Tolkien invented a mythology with a creator god, and sub-creating “powers” – the Ainur – who together sang Arda into being. Some of these, the Valar and Maiar, continued to care for it and its creatures -- enough to enter into it -- up to and including the time of LotR. The filmmakers eschewed most of what sounded explicitly religious in the story of LotR (very little, really), focussing more on the theme of the good that dwells within people, and their fellowship with each other, rather than a 'higher' good. At the coronation of Aragorn, film-Gandalf says, “Now come the days of the King; may they be blessed”. Blessed by whom, by what? Book-Gandalf says, “... may they be blessed ... while the thrones of the Valar endure.” No doubt the qualifier was cut lest viewers be confused, not knowing who the Valar are. But perhaps it was part of the larger tendency to downplay the role played by Eru and the Valar as too obviously religious. But the filmmakers only downplayed what is religious as expressed in words. When it came to the images created by music and the visual arts, religious references were all over the place. They certainly were going on the scene of the mithril shirt. Watching it over and over, I realised that what made it so deeply meaningful (to me) was its roots in religious iconography. On the surface of the screencapped scene, the members of the Fellowship merely are oohing and aahing over a beautiful piece of Dwarvish mail-work, beyond price, and marvellously made, to be sure. But is that all they are marvelling at? Even if it was an unconscious choice on the part of the filmmakers, the iconography of this scene leads the viewer to see and hear what is going on as something transcendent. It’s not just that Frodo has been saved by wearing an extremely effective piece of gear, he’s been saved by – well – by grace. The shirt is a talisman, a mediator of divine protective power, just like the phial of Galadriel -- or the cloaks that hid them from evil eyes -- or the lembas that fed the will even when it did not satisfy desire, giving “strength to endure beyond the measure of mortal kind”. The mithril shirt is a token of the divine favour that watches over Frodo as he carries the weight of the world around his neck. 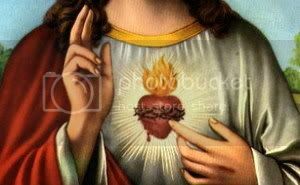 I Googled up a slew of images of “the Sacred Heart”. I am sure this figure of a divine person, shown with his or her hands pointing to his or her heart, may be seen in other religious iconography, not just Christian. It is an archetypical image. The heart stands for the core of who a person is; it stands for that which makes humans fully human: enthused, caring, loving, with wills able to act on what their minds deem true and right. Warriors are "brave hearts", the despairing "lose heart", and lovers and mystics have "burning hearts". What the "Sacred Heart" as a religious icon or symbol means to convey in Christian devotion is the love of Jesus, which in turn reveals the divine Love that burns for the world and its creatures. Reflecting upon this, I would say that this film scene so moves me not just because it draws on a familiar religious icon, but because the icon resonates with the LotR story. Reflecting upon this, I would say that this film scene so moves me not just because it draws on a familiar religious icon, but because the icon actually makes sense with the LotR story. Again, I am not saying the reference was intentional on the part of the filmmakers; more than likely the image emerged from what is a subconscious store of images shared across the culture. That is how religious imagery works for most of us, including me. But a heart burning with love seems an apt image for Frodo Baggins, in whose heart a love for the Shire blazed up -- once he learned it was in danger -- and in whose heart a flame was said to have leapt when he thought of following Bilbo on his Quest. "Following Bilbo." 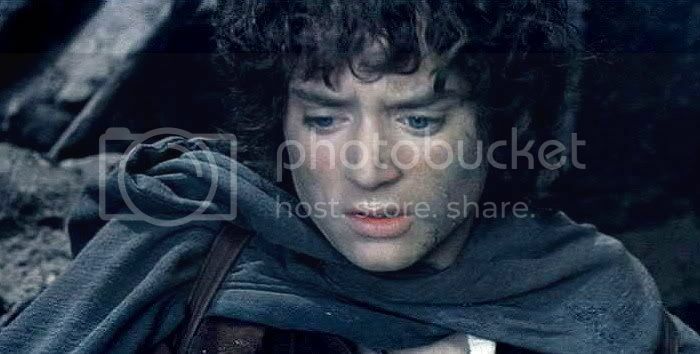 What did it mean, for Frodo to follow Bilbo? Speaking off the top of his head Frodo might answer, to go on an adventure, even to experience danger in so far as it is exciting. But Bilbo’s adventure meant more than danger, it meant suffering. In his own time Bilbo was called upon to save the day, as Frodo would, but at a cost. Bilbo did not have to get the Ring to Mt. Doom, but caught between warring factions who should be allies, he took a coveted jewel, the Arkenstone, and gave it to Thorin's enemies, which caused fury and intense grief to Thorin, whom Bilbo loved. Bilbo's adventure was shot through with anguish and grief. Frodo followed Bilbo more than he knew. By drawing a comparison to the image of the Sacred Heart, I do not mean to imply that Frodo is a figure of Jesus. But Frodo does, as a character, manifest a humble, almost pure goodness of character. Although he is little and vulnerable, as are all mortals, really, he risked much -- even all -- out of the fire of love that burned within his breast. Love burned in him for the Shire, for his friends, for the cause of the peoples of the West, and for the mysterious Powers he knew not but which knew him, especially Elbereth, servants of the maker of Arda. To what do the fingers point in the frames from the Mithril Shirt scene? To shining Dwarvish metal, rare and beyond price, marvellously made, and strong to save, all hidden under homely cloth. This could be a metaphor for Frodo himself: a hobbit: mortal and small, but who bore within him a rare and shining light. I think this scene, consciously or unconsciously, means to bring that light to view. Frodo's light, but also the light of the One who made all light, and which in Frodo glows uncommonly bright. Below is a screencap of the mithril shirt which I find so iconographic, followed by a series of [cropped] paintings of the actual icon, the Sacred Heart of Jesus, for comparison. Note that the motif of the Sacred Heart need not be limited to divine beings. 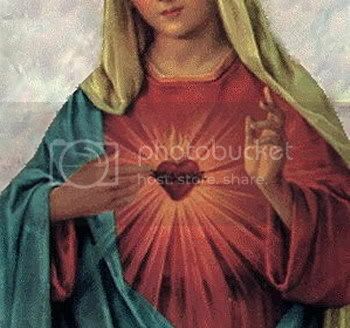 Below these is a cropped image of the Sacred Heart of Mary. Mary was a human, not a god, but she was revered for her burning love for the world, and for its people. Again, I don’t mean to be blasphemous, only to lift up what I and perhaps others sense radiating from within the character of Frodo. 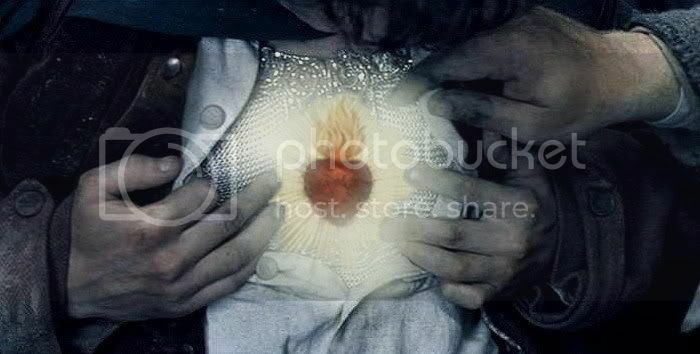 So I made a little manip, a sort of "Sacred Heart of Frodo", in order to illustrate my point more graphically. As an unexpected boon while looking for icons of the Sacred Heart, was coming across an amazing icon of child-Jesus, a devotional image popular in many Spanish-speaking countries, Santo Niño de Atocha. This particular image was painted by contemporary artist Fr. William McNichols. If you would like to know more about devotion to Santo Niño de Atocha, read the Wikipedia entry here. * Note: The formal devotion to the Sacred Heart of Jesus became popular after a 17th century nun, Marguerite Marie Alacoque, saw a vision of it. 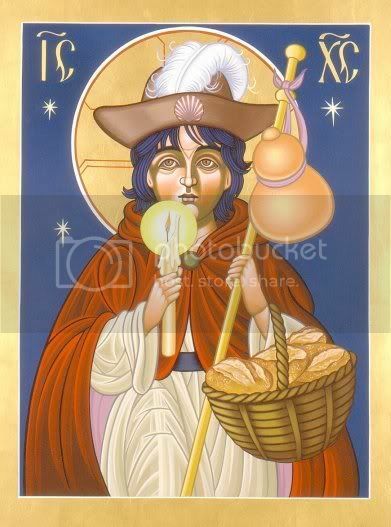 My goodness, that drawing of Santo Niño de Atocha certainly does look like Frodo with the light and lembas! I guess this scene did not effect me the way it did you, and perhaps it is because I do not have the religious background that you have. But it certainly is an interesting take on it. Thank you. I guess this scene did not effect me the way it did you, and perhaps it is because I do not have the religious background that you have. Oh, I was swooning for "transcendent moments" in film and over art with religious subjects from way back when, long before I had a religious bone in my body. I don't think people need to see themselves as religious to be moved by religious themes or motifs. A lot of people I know are post-church, even post-God, no longer believing any of the teachings (not just Christians but Jews and Muslims). But they still respond to the imagery and themes of religious stories, which appeal to the hearts and imagination even if the intellect is not on board. I agree in everything...I am catholic and when I was younger I did teach to children preparing them to Communion,and I had to study some theology ,christian and jewish as well.I am telling you this to let you know that I know about it and you are perfectly right. There are catholic monks in Italy who some weeks ago celebrated Tolkien and his world as allegory of our religion.If I find the link I put so you see. And,I do see Frodo's character as Jesus,the ring is the cross. Elves are angels,and look at Arwen's pictures ,in some she looks like Virgin Mary. Thank you my dear...I admire you for the time you dedicate to the analysis of the movie's scenes. Thanks, Janira. I actually am a Catholic, a rather lax one, but only since middle-adulthood. I grew up without any religious formation, my family identifying itself on forms but that was about it. But there was loads of religious art around then: paintings, music, trinkets, pageants, bible movies -- it wasn't as though I was unexposed to the symbols and many stories of Judaism and Christianity. I didn't believe them, and some of it I found seriously disturbing, but I always loved the music and pictures. That's why I think religious imagery can "work" for people who don't consider themselves religious. The images and themes are so interwoven into the history of art and literature, they resonate with viewers and listeners even if they are unacceptable as cognitive truths. I saw your post in Italian down there and wondered what it was, recognizing about half of the words. Thanks for the explanation! Blasphemy is a silly crime. I think God is big enough to handle a little inquisitive speculation, IMHO. 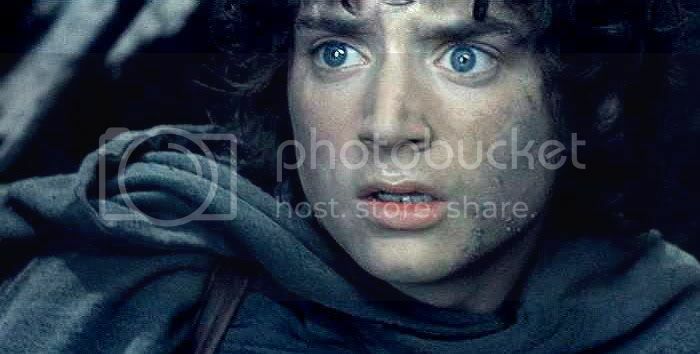 Lovely pics of Frodo. I enjoy all your beautiful sequences and commentaries. Cheers! Mariole, what is that BLASPHEMOUS icon you have there, portraying Frodo as Adam biting the apple offered by Eve received from the snake???? Seriously, thanks for commenting. If you read what I wrote answering the comments of Primula and Janira above, you'll see that I think the religious iconography in LotR, book and film, is effective for fans even if they don't believe the stuff. I love your caps. And ohhh, how I miss this scene in the movie! I know it would have slowed down the action, but what a lovely "Fellowship-y" moment that would have been. And it would have been another look at the "healing hands" of Aragorn. I can't believe you haven't written a fic set in or around that scene, Shirebound. It seems so "you"! But the book scene is already such an excellent piece of storytelling, I suppose there's nothing much to improve, and no gap to fill. But I would have loved to have seen that scene in the movie, too. I would have loved to have seen the valiant hobbits treated and anguished over in Cormallen (or the HOH if they wanted to move it there). It shows so well what it cost Sam and Frodo to accomplish the Quest -- a lot better than the cousins jumping on the bed for five minutes, anyway, lol. The portrayal of Aragorn as a leader who is also a healer is so important in the book, and so recurring. I guess that once the film-makers decided to cut the HOH from the theatrical, made explicit in Ioreth's line about the hands of the King being "the hands of a healer", they didn't stop to figure out ways to include more of that role in the films. Venerdì 16 febbraio alle ore 17.00 presso la Sala Stampa del Sacro Convento di San Francesco ad Assisi (nella Piazza Inferiore di San Francesco, dirimpetto alla Basilica) verrà presentato il libro Lo specchio di Galadriel. I francescani celebrano J.R.R.Tolkien, edizioni Il Cerchio , Rimini 2006. Questo volume, opera di vari autori - come Bernardino Coppola, Giorgio Diale, Alberto Franceschetti, Donato grilli, Graziano Maria Malgeri, padre Guglielmo Spirito -, nasce come raccolta dei contributi presentati durante il Seminario di Studi da alcuni studenti del Seminario Teologico di Assisi, svoltosi in celebrazione della visita fatta da J.R.R.Tolkien presso la bella città umbra nel 1955. Oltre agli Autori, interverrano alla presentazione Franco Cardini, Edoardo Rialti e l'editore, Adolfo Morganti. Thank you for the caps!!! The right button on my mouse is smoking. Your screen caps are so wonderful and you are so articulate - even if I don't agree with everything it is interesting to read. 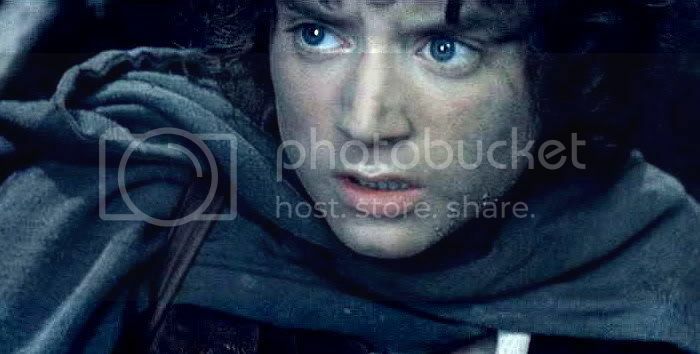 I really appreciate your thoughts on Frodo's motivations in the book vs. the movie in revealing (or not wanting to reveal) the mithril vest - I just wish I could say it as well as you do! I'm glad you didn't mind my going on and on. Obviously, I was on a roll! I really love the scene in the movie, as you can tell (except for the length of Frodo's slo-mo groaning reaction; excessively long, I thought). But every time I prepare one of these entries and get out the companion book text, I always have a twinge of regret, thinking, Yes, I loved the film scene, but wouldn't the scene as written have been grand, too, maybe even better? Not blasphemous at all, and I don't feel offended. In fact there is more than one moment in the book (and even more in the movies) where the temptation to compare Frodo with the christian redeemer gets nearly overwhelming. What always kept me from stumbling into this trap was the deep certainty that the professor wouldn't have liked this idea at all. 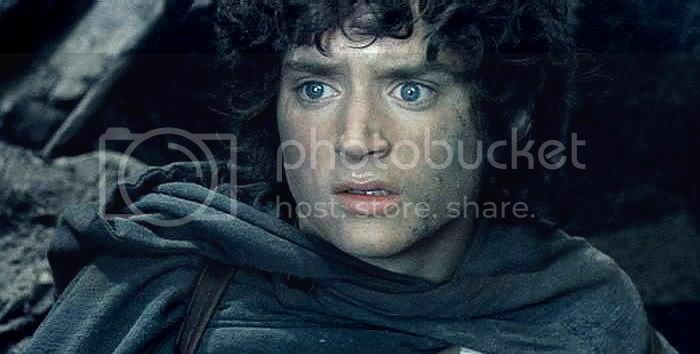 And still... take the moment when Frodo and Sam have left the Sammath Naur, battered, exhausted and at the edge of dying, and the camera shows Frodo's face, filled with a bone-deep, wondering relief. And he says "It is done"... which reminds me each and every time of the last words Jesus says at the end of the crucifixion. I just checked my english bible where the exact words are It is finished - but the german (lutheran) translation says Es ist vollbracht (an ancient expression for "It is done"). I was always terribly thankful that the german translators of the movie scene chose to use the literal translation, making Frodo say: Es ist getan. The similarities in this scene are strong enough without pushing them to the limits. I think all the protagonists of LotR have "Christ-like" elements to their characters and stories, not just Frodo. But he does come in for a lot as "suffering servant of the Quest". Actually, Belegcuthalion, if I had to assign Frodo a role in a religious pageant, I would cast him as "Pilgrim" rather than as Jesus. I see in him the person who shows the way for me, who goes ahead of me on the road to meet sorrow and joy, but I don't see him as my saviour. I am sure Tolkien would not have liked Frodo talked up as a "Christ figure", and he isn't, except in isolated moments. I think of that "It is done" parallel, too. I can't help it. I've listened to too many Easter Oratorios, watched too many bible movies and heard too many Passion Sunday lesson read. I was always terribly thankful that the german translators of the movie scene chose to use the literal translation, making Frodo say: Es ist getan. The similarities in this scene are strong enough without pushing them to the limits. I agree. No sense beating viewers over the head with it. That would make it like allegory, and you know how he hated that. If the symbolic references are subtle, though, they can be appreciated in terms of applicability, which he approved of. Hi Mech! Thoroughly enjoyed your post and the beautiful screencaps. I guess you don't need to be a Christian or an art lover to appreciate that, but since I am both I was intrigued. I have only ever thought of the Mithril shirt as a possible allegory to the "armour of faith" described by St Paul the apostle. Knowing, however, how Tolkien felt about allegory, I will not dwell on it here. I think you also showed very well in your post that you are aware of the intricacies of that matter. Oooh! "Armour of faith" -- that's a good connection, too, Eandme. But you are right that it's a mistake to make allegorical interpretations. I tried not to do that. I do think religious images are all over the place in LotR, book and film, but they are there in a subtle way, woven right into the stuff of the story. When they work for a viewer they resonate, but few viewers make an explicit, intellectual connection, as in: "Ah, Galadirel has her arms lifted in the Orans position; that shows Tolkien meant her as a Mary-figure, or a priestess of ancient times, at least." Naaah, that's too analytical. The stuff of interesting message board threads or dissertations. But if the viewer watches her raise her arms, tall and glorious, from within the perceptions of Frodo, the viewer can feel what he felt, which would include a feeling of awe like reverence, without bothering to think about how there might be a Marian connection. 'divine protection' treatment. I think that's why we feel such outrage when the Orcs take it. Not because it's a costly thing, or so much because it's beautiful, or even because Frodo has been robbed of such protection - but because it's a precious gift of grace. Righty-ho, Peachy, on the response to the taking of the mithril shirt by the *loathesome* Orcs. I was just listening to that scene on Rob Inglis-narrated book-on-disc (from the library; it's very good, by the by) -- the CU scene and the presentation of the tokens by the Mouth of Sauron (I forgot Tolkien described him, a living Man, as "crueler than any Orc"). It really does seem as though they are dragging something pure and good through filth when they paw over and fling about that corslet. Thanks so much for commenting, Peachy. For me, as I've said elsewhere (and fairly often), LotR has been a part of my spiritual journey since first I encountered Bilbo at age 8. I see JRRT's views on spirit and the working of grace in the world written deeply into LotR (at a mythic level) - there, in his words, as the table or person that Picasso painted are still there in his refracted images. I do not think that JRRT meant to write religion, nor to limit the book's meaning only to those who shared his faith, but rather to write deeply about how he believed the world moves, and never to write a world in contradiction to the one he believed in. 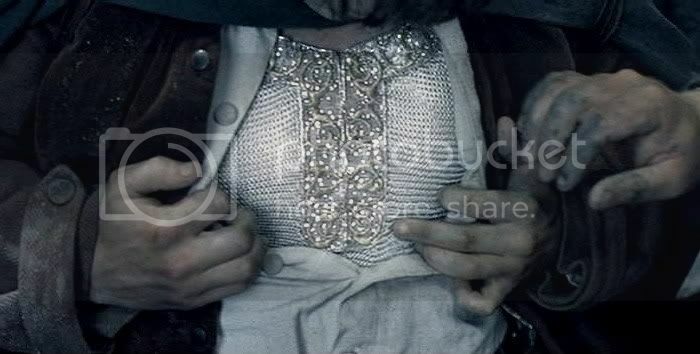 The mithril vest, its 'worth greater than the value of the Shire...', is a mere token to Frodo's own worth; the reaction of his fellows in the film to seeing it is similar to their reactions later at seeing another, Gandalf, returned to them from seeming death. The vest is a lorica - and for me, emblematic of the hymn most important to me (for many reasons), St Patrick's Breastplate (which inspired the first novel length LotR tale I wrote, and write still). Today at Ash Wednesday services, I thought of Frodo, and of his willingness to give himself as a sacrifice, of the degree to which he was caught between temptation and evil. Thinking on the ways in which LotR intersects with spirituality compels me (as well as simple love for the text, the films, the characters). I have enjoyed reading your thoughts very much, and thank you for this carefully considered, lovely post. Thank you for your comment, Nota, gracious and insightful. You are so right to compare the Company's awed reaction to Frodo's revelaling of the mithril shirt to the reactions of Aragorn, Gimli, and Legolas to the revelation of Gandalf in Fangorn, un-looked for, blinded by the light of his transfigured self, back from the dead. And I, too, can see the shirt as a metaphor or sign for Frodo himself, although the comparison works better for me if the glittering shirt is covered by his ordinary Shire clothes. If you extend her thought -- that it's an outrage that the Orcs paw over the mithril shirt because it's a precious gift of grace -- it's the same sort of outrage to think of Frodo being pawed over by them, since he, too, is a precious gift of grace. Watching them fling the shirt around, almost pulling it apart as they fight over it as spoils makes me think of them doing that to Frodo as their captive. Thank the Valar Sauron wanted him delivered to Barad-dûr in good condition! But the mithril shirt is what most moves me as a physical metaphor for Frodo. When that little shirt is revealed among the tokens by the Mouth of Sauron outside the Black Gate(book scene, not film), my heart constricts. As I imagine that little thing, so fine, so radiant, on display as a spoil, I can't help thinking of its wearer, also finely made, strong and full of light. And as you point out, like the shirt, his worth is beyond reckoning; this rare and "best hobbit in the Shire". For me the intervention of the eagles is also an act of grace bestowed by the Valar - reward for Frodo having completed his quest. After enduring hardship, humility, suffering and torture he is raised up by the Valar and borne away by the eagles, who to my mind seem more like arch-angels. Coupled with the sublime music accompanying this scene it's an overwhelming emotional moment for me. Like you I don't know if the religious overtones are intentional for this rescue scene by the film-makes but to me when I watch I feel as though I have entered a soaring cathedral and am dazzled by the sunlight pouring in through stained glass windows. 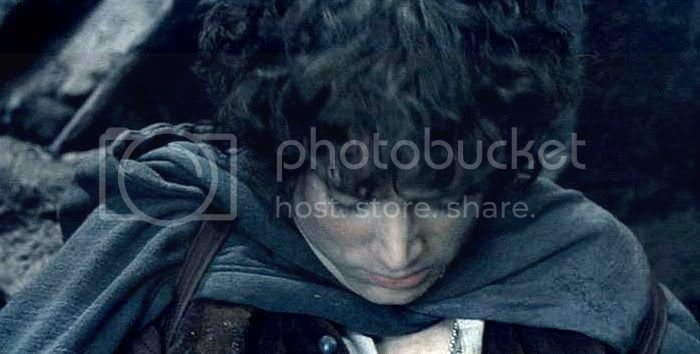 Frodo's expression of acceptance and subdued ecstasy remind me of a particular statue of St Therese. Wow, that's gorgeously expressed, Chickenlegs. I know what you mean. One of my first posts was about the rescue-by-Eagles scene, calling it only half-jokingly "Frodo's Assumption into Heaven", since in no time at all he'll be borne off to the Undying Lands, still living, but where his body will not see decay, even when he dies. The Eagles scene is the most sublime moment in all of film, I think. It makes people with no god notions at all swoon for the beauty and joy and pity of it. 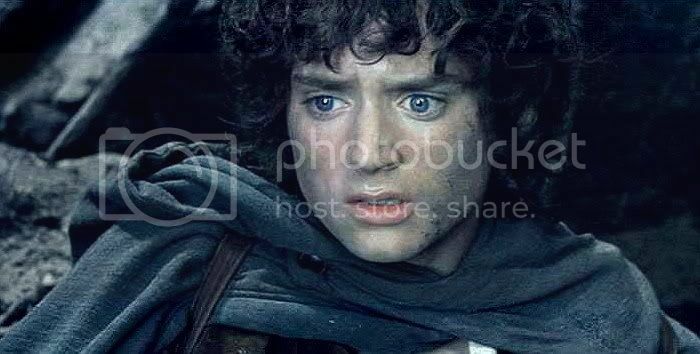 If it were the same scene shot about a real saint, they wouldn't respond, but the suspension of disbelief they are already excericising, becoming involved in the story of Frodo, whom they love and with whom they identify, makes it possible to share his moment of near-religious ecstasy. Yes, the St. Therese and the angel (piercing her side with an arrow of love, Cupid-like) by Bernini. It's one of my favourite statues, and one that I think a perfect picture of the All-encompassing, Overwhelming Swoons in life, no matter how evoked: religiously, amorously or aesthetically. Go, Bernini! 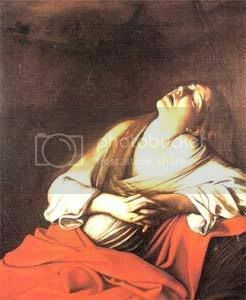 (I found out reading about Caravaggio that Bernini probably got the image for her swooning face from one of C's portraits of the pentitent Mary Magdalene. Here it is, small, but the only online copy I could find. Again, thanks so much for commenting, Chickenlegs. It's good to hear someone else sees these things. Better still that they say what they see so clearly and eloquently. Mechling, you continue to enhance my appreciation of Frodo's unselfish character, the book and the film with your eloquent commentary. You bring out the best comments in your reader’s too. 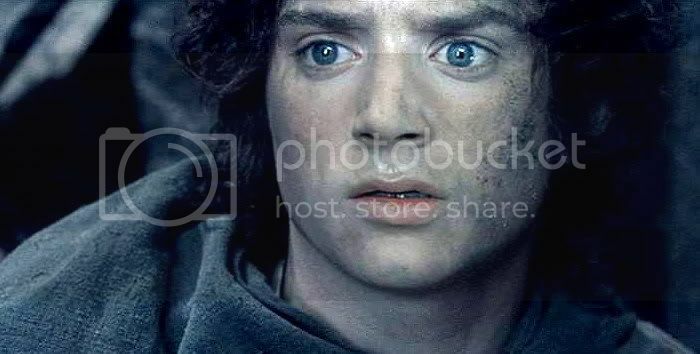 Frodo is extremely beautiful in your screen caps. Thank you for sharing your time and patience with us. Concerning religious imagery – do you remember the beautiful video, that Whiteling attached to one of her LJ entries? The one with the German group QNTAL – they had made a beautiful music video with the help of Fairy-artist Brian Froud. It was called ‘Von Den Elben’ (with the elves?) I remember that you admired the costuming in particular. I am attaching a link to YouTube for this Music video because it shows similar images of the heart. I do wish I knew what they were singing about. Thanks for linking that, Este. I had forgotten about all the hearts in that piece, it is so cool. The hearts in it all seem to be variations on traditional Valentine hearts, though, rather than the ones that appear in paintings of the Sacred Heart (which usually has the flames coming out of the top and is girdled with thorns). I loved best the ones that most looked like the Sacred Heart iconography, though -- the ones with rays of light shining out from the heart's center. That image really gets me. Again beautiful screencaps! Thank you so very much. And your thoughts about this sequence were a joy to read - and I loved the Sacred Heart analogy. Thank you! I'm glad you could relate, Frodosweetstuff. 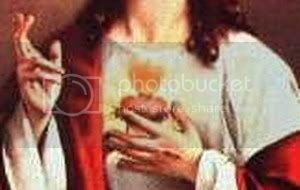 I really didn't know that much about the symbolism of the Sacred Heart until writing up this post, although I was very familiar with the image from religious statues and pictures, etc. As odd-looking a devotion as it seemed to me at first (praying to a body part??? ), when explained -- especially due to Whiteling's comments, telling how it went back to Benedictine spirituality in the 12th century -- it was really rather moving.